Tampa area, Hillsborough and Pinellas counties, west Florida Farmer's Markets: Find a local farmer's market near you in Tampa area, Hillsborough and Pinellas counties, west Florida for fruit, vegetables, pumpkins, organic foods,local produce and more! Looking for a local, true farmer's market in Tampa area, Hillsborough and Pinellas counties, west Florida? Scroll down this page and you will see the farm markets, farm stands, roadside stands, produce markets, even garden fruit and vegetable stands and seasonal community farmer's markets in Tampa area, Hillsborough and Pinellas counties, west Florida, sorted by county. Markets offering organic or sustainably grown produce are identified by the words "organic" and/or "sustainable" in Green, next to their name. If they have a website, the name will be in blue and underlined; click on it and it will open their website. Tampa Bay Farmers Market - Farm Fresh Fruits, Vegetables, Cut Flowers, Potted Plants, Gifts & More. 2801 E. Hillsborough Ave., Tampa, FL 33610. Phone: (813) 237-3314. Alternate phone: 727-418-3662. Email: peterf.twpm@verizon.net. Email: Johnd@coastalfoodgroup.com. 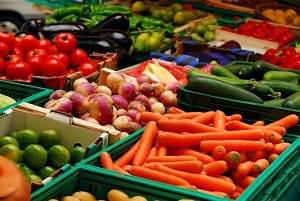 The Tampa wholesale produce market is the Tampa area hub that distributes to the restaurant industry, hospitality, and other local wholesale produce distributors. Comments from a visitor on February 18, 2011: "A wonderful Hydroponic Farm with organically grown veggies in Tampa, FL "
Comments from a visitor on December 23, 2009: "They have been in business since 1922. Great company that is very active in the local community. "